For 28 years you couldn’t leave or return to Belvedere or Tiburon, California, without passing a swaybacked horse named Blackie. 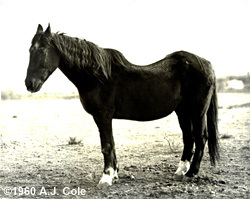 A cavalry horse in his youth, Blackie later became a cutting horse at rodeos, appearing in the Salinas, California, rodeo although his owner, Anthony Connell, doesn’t remember the year. He was retired to a private pasture at the corner of Tiburon Boulevard and Trestle Glen Road when he was 12 years old. Mr. Connell visited him daily, as did children and adults alike who could be seen regularly feeding Blackie apples, carrots, and sugar cubes. Those who lived in the area when Blackie was alive considered him as belonging to everyone. In spite of his age and swaybacked condition, many felt he still exhibited a military air and pride that came from having been a great horse in his early years. Back then the Army stabled horses at the Presidio. In the spring they saddled up, rode to Yosemite, and patrolled the park all summer. When winter arrived they returned to the Presidio. Blackie was one of the horses used on this detail. It was a sad day when Blackie collapsed on February 27, 1966. The Marin County Health Department approved his burial in the pasture where to this day his grave is marked by a simple cross and a memorial plaque made possible by contributions from concerned citizens of the peninsula. Blackie lived for 40 years, which is unusual for a horse. It was love that sustained him, the love he received from old-timers and newcomers alike. Thanks to a wonderful gift by the family of Gordon Strawbridge, Tiburon's first mayor, the Tiburon Peninsula Foundation erected a life-sized sculpture of Blackie in his pasture which is visible to all who drive by. 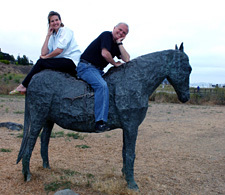 Erected in June of 1995 in what is now known as Blackie's Pasture, the life-size bronze statue was created by the noted Bay Area artist, Albert Guibara to honor Tiburon's beloved "mascot" Blackie. For more information about Blackie and Blackie's Pasture, go to the Tiburon Peninsula Foundation website.